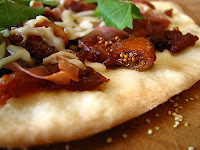 Curves and a Camera: Holy Fig & Prosciutto Batman! HOLY SMOKES! I'm in love and I haven't even tried it (yet)! Note: Flatbreads are available at Trader Joe's and Middle Eastern markets. 1. Remove the stems from the figs, then cut the figs into quarters. Place in a 9-by-12-inch glass baking dish. Combine the port wine, balsamic vinegar, brown sugar, rosemary, shallots and salt. Pour over the figs and roast in a 375-degree for 30 minutes, stirring several times. Remove from the oven and set aside to cool slightly. 2. Cut the prosciutto horizontally into half-inch strips. 3. Place the flatbreads on a baking sheet and bake for 5 minutes. Remove the baking sheet from the oven and turn the flatbreads over. 4. Place the fig mixture in a food processor and pulse 4 or 5 times to break up the figs. The mixture will resemble a thick marmalade. 5. Spread about one-fourth cup fig mixture on each flatbread to within half an inch of the edge. Sprinkle the blue cheese on top of the jam, evenly dividing it between the 6 pizzas, then drape the prosciutto slices on top . 6. Bake until the cheese has melted and the flatbread is crisp, about 5 to 7 minutes. Slice and serve warm or at room temperature. ooo I *will* be trying this one! The fig and blue cheese combo sounds incredible! And i found your blog from 20somethingbloggers. yay 20 somethings!